Ahh, creativity. Thou hast brought me great joy. Thou hast caused me great angst. This is the life of an artist, yes? Unfortunately, yes for most creatives. We put ourselves in an extremely vulnerable place. We open ourselves up to so much, pour ourselves out, and filling that well back up can be almost impossible sometimes. 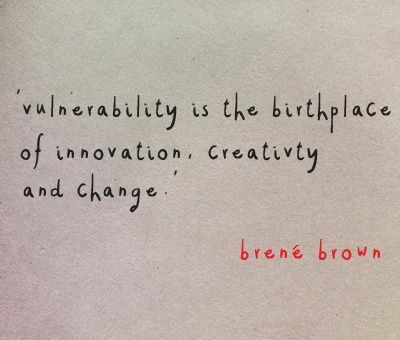 Especially since really, we require more filling than others because we are so vulnerable. I actually pinned this a few days before Robin Williams death. Here was a powerhouse of creativity and vulnerability who understood. Creatives can be in a room full of people, but still feel set off from the rest, still feel different, still feel empty. Alone, yet stand out. 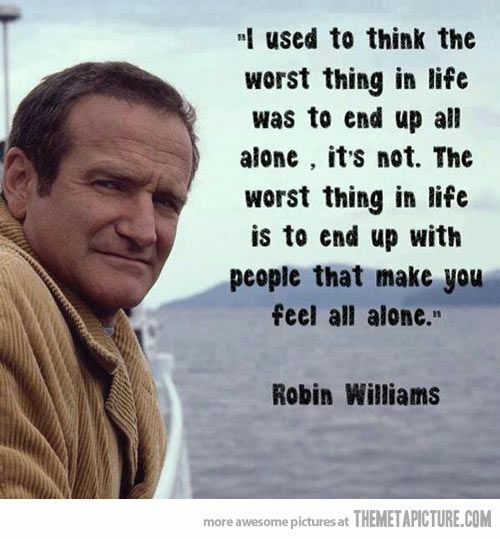 Especially when you throw in depression/anxiety– because really they are kissing cousins who walk hand in hand. There in is the ying and yang: the high of creation, of letting God flow through you to make something that will touch others–swing to the low of emptying yourself into something no one recognizes or gives credence and the low esteem that follows. He was able to embrace his madness and spill it out onto the screen for all of us to be filled with his creativity and humor. I didn’t know the man obviously, but I have watched many of his movies , which are favorites, over and over and over. 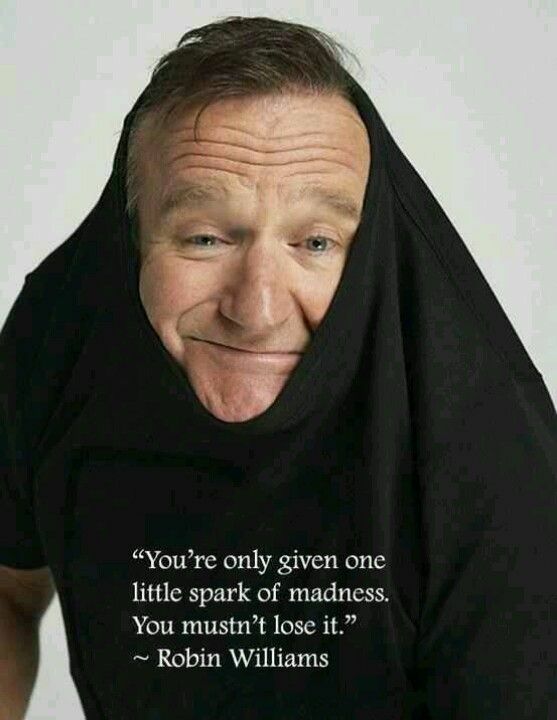 Many of the other quotes I found were from movies, not necessarily things Mr. Williams said. But the way he recited those lines with gusto, emphasis and emotion made me believe that he felt that way. Made me feel like he was directly channeling the screenwriter and touching each of us watching. What a gift. But obviously he had those demons. He didn’t always get refilled for everything he gave. And that is sad. So sad. That he felt alone still. He maybe had those feelings that, even if he didn’t feel alone, he believed those closest to him would have it easier without him. That’s the part people don’t always understand about suicide. In my case, I didn’t consider suicide only for selfish reasons, but that I thought it would be truly easier and better for everyone concerned if they didn’t have to deal with me. Others would probably miss me, yes I understood that, but from the bottom of that pit I thought there were few choices: waste a lot of money locking me up for the rest of my time and they would lose me to craziness but still have to deal with me, or waste everyone’s time trying to control the crazy being around them, or just let it be over for all of us so we could move on. As a depressed person, it can be easy to believe the last one is the best choice for everyone. Thankfully, I am out of that pit. I had people close to me that helped me realize there were other choices–ones that could help me survive the vulnerability, maybe not need quite so much filling, ones with less drama, options that would help the chemical imbalances I could not control, no matter how hard I tried. Medicine was able to pull me back. My faith, friends and family keep me evened out. But still, if I forget that medicine, I can, and will, crash. What a beautiful and poignant post Nic. I don’t understand completely depression and despair but you have helped me to imagine it. I’m so glad you are okay. The death of Robin Williams makes me believe that no matter how much money you have, it can’t bring you happiness. Money Is not the essence of happiness….in fact it can make you more vulnerable and unsure. Its so sad he took his own life. For the moment, though, it was all he could think of to do. This was a good message. Your artwork is wonderful. Continue on!